Naan Forest is an intermittantly forested belt of woodlands between the vast plains of Rola Sierrie to the south and Nidalery to the north. It flows out of the Holy Hares Holly's Holes ... eastern foothills, and into the denser Corali Forest in the west. Naan's central location on the island makes it an ideal location to observe two of the Colonies' major trade routes: The Portion-Outer Tilog-Giblot and Portion-Alebad-Alowca roads. Despite the obvious tactical advantages the forest posesses, its history has been largely free from warfare... though it more than makes up for that with misery and torment. Naan "Forest" is a bit of a misnomer. Rather then being one solid area of woodlands, it is composed of smaller forested areas interspersed with cleared areas and meadows. Though the origin of the region's name is lost to history, the locals have made it into their private joke - it is indeed a Non-Forest. 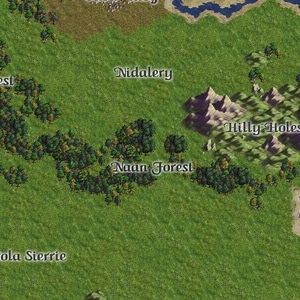 However, many travelers and merchants have been misled by the humorous double meaning in the Forest's name. For all the apparent mirth in the name, there are plenty of dark tales to be told about Naan Forest. Some are dark and dire, some are haunting and bleak, while others are wildly fantastical... but all of them give unmistakable warning: something is not right in those woods. The wise travelers stick to marked roads and the larger clearings. Even in the height of summer, chill winds blow through the treetops as patches of mist cling to the undergrowth. Apart from the occasional game path, there is a large amount of low brush around the more heavily traveled areas... almost as if the forest was barricading itself from outsiders. Inside the wooded areas lies a confusing tangle of footpaths, dry stream beds, and game trails. Many of the trees and rocks are marked with strange symbols and carvings, or snippets of text in forgotten languages. None of the typical bird calls or buzzing of insects can be heard within Naan Forest. Rather, there is an unnatural quiet, almost as if the silence was a tangible thing. Initially, the region was pacified and claimed by Outer Tilog, who used its location and vantage points to spur their realm to 7 or 8 regions. It was governed by the Lady Despyria Eiryn, whose atrocities were the stuff of legend. Even to this day, her name is only spoken amongst the peasantry in whispers, such is her fearsome reputation. In time, though, Outer Tilog's fortune shifted, and most of their regions were driven rogue or taken outright, and Naan Forest was left wild and ungoverned. Seeing an opportunity to bring light to the former regions of darkness, Alebad moved in and brought stability and peace to the wild people of the Forest. During their pacification program, Alebad brought in the noted scholar Ardrryn Dynrode, who brought the benefits of lifelong study within Alebad's great library. He spent months educating the peasants, and erasing much of the evidence of Outer Tilog's oppressive misery. With his dedicated work, they were sufficiently equipped to run their affairs more or less on their own. Naan Forest was without a Count for much of its time under Alebad's control, though when the armies of Outer Tilog arrived on its doorstep at long last ready to reclaim their lands, the young Giorsoine Nathibur, a local noble, was tasked with defending the region and keeping it from harm. Unfortunately, the Alebadian armies were engaged elsewhere, and the small local militia couldn't hope to stand up to the Tilogian horde. In short order, Outer Tilog's flag flew atop the regional government offices once more. During the Outer Tilogian reacquisition, much of the forest was burned, leaving further holes in the already spotty forest coverage. The new Countess, Murakama Yukiko, has already implemented a planting program to restore the region's timber, but rather than planting the happy little trees favored by Alebadians, she has gone with a more "dark and foreboding" choice. Not quite dead, yet more alive than possible, some say the region's new trees are just the first sign of the mysterious new presence that has settled over the entire area. Whatever activities are concealed within this dark wood, the locals tell stories of Outer Tilog and its agents that defy description. This page was last modified on 3 March 2017, at 11:24.